To Iraqi Christians: Embrace martyrdom with joy! The news reports coming from Iraq leave us in dismay and disbelief: thousands of people, including many Christians, driven from their homes in a brutal manner; children dying of thirst and hunger in their flight; women taken and carried off; people massacred; violence every kind; destruction of historical, cultural and religious patrimonies. All this gravely offends God and humanity. Hatred is not to be carried in the name of God! War is not to be waged in the name of God! 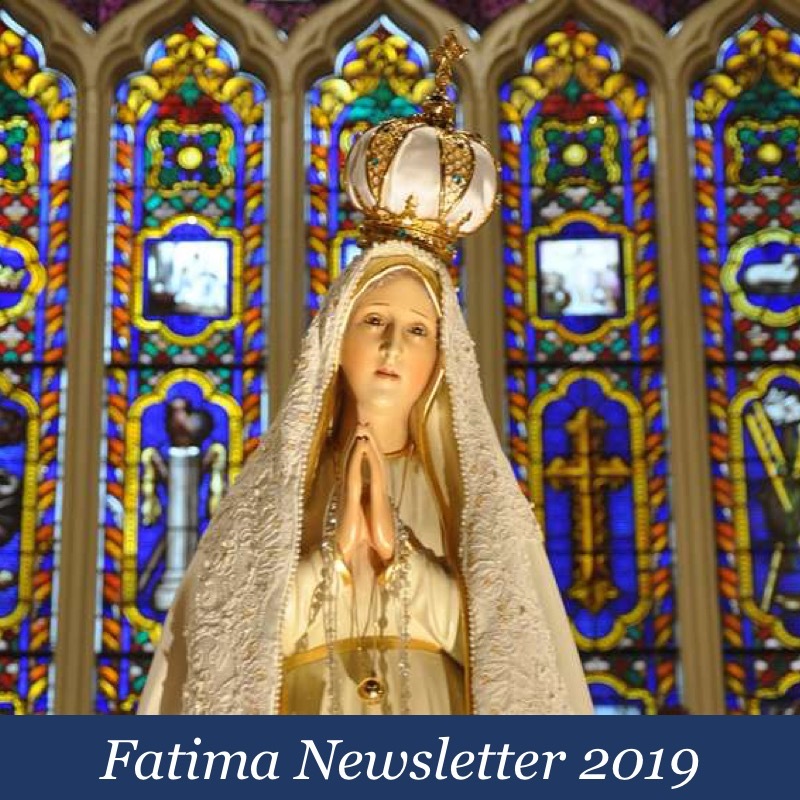 At times such as these, when the spiritual battle that ever rages beyond the veil is made manifest in the here-and-now, it is right for Catholics, and indeed all peoples, to look to the Holy Father for wisdom and guidance. With the eyes of the world so fixed on Peter’s Successor, imagine what would happen if, in addition to calling for an end to the persecution, Pope Francis were to repeat the encouragement once offered by St. Boniface as recounted in the Encyclical of Pope Pius XII, Ecclesiae Fastos. No doubt, if the Holy Father were to invoke such words in order to strengthen the resolve of the persecuted Iraqi Christians unto martyrdom, many throughout the world, including no small number of Catholics, would either be outraged or simply discount his commentary as mere foolishness. And yet, such would perhaps be the most meaningful, most praiseworthy, and most eminently Catholic encouragement a pope could ever offer such a people. It goes without say that this is exceedingly unlikely to happen, but even if by some extraordinary operation of grace Pope Francis was moved to so speak, he would largely have himself to blame for whatever negative reactions his words may invite, especially among Catholics. For this slight momentary affliction is preparing for us an eternal weight of glory beyond all comparison, because we look not to the things that are seen but to the things that are unseen; for the things that are seen are transient, but the things that are unseen are eternal. The situation in the Church today is not unlike that of a household wherein the father is so irresponsible, so permissive, and so entirely determined to be popular among all that he even goes so far as to get high with his kids and their degenerate friends. And so it is in the Household of God under the present pontificate, with a Bishop of Rome who appears preoccupied with matters almost entirely earthbound, and whose commitment to universalism is so unbridled as to actively encourage Muslims to cling to their false religion. Sure, I suppose Pope Francis could, in theory, by a miracle on the order of the raising of Lazurus, suddenly go from the secular media darling in white who couldn’t find room for Our Blessed Lord on his “Top 10 Secrets to Happiness” to a Holy Roman Pontiff who exhorts persecuted Christians to hold fast to the promise of eternal glory in Christ Jesus, even unto martyrdom, but let’s be honest; if he did, could you really blame anyone who failed to take him seriously? That you may remain in the state of grace. That at the moment of testing, you may be courageous, taking strength from the Lord, fearing not those who can kill the body but cannot slay the immortal soul. That you may, by grace, embrace martyrdom with joy if and when it may come your way, confident in the belief that the Lord will grant unto you an eternal reward and a place in the heavenly court. This, for you, is my prayer. “During the return flight from Rio de Janeiro I said that if a homosexual person is of good will and is in search of God, I am no one to judge. By saying this, I said what the catechism says“. Unfortunately I cannot find the complete or original text (in latin?) anywhere on the net. You can find it in the Enchiridion Symbolorum (Internet Archive). It apparently doesn’t contain the text of the entire Bull, as the section is titled: Ex Bulla “Cantante Domino”, though, I’m not sure if you need the whole thing or just this quote. Either way, the E.S. has 13 paragraphs of the original in Latin. The entire document could probably be found with a bit more effort. Thank you Matthew, you have been very helpful. I didn’t even know such a thing as the Enchiridion Symbolorum existed on the web. It’s ok just this quote, which is the main one, whos translation is abundantly circulated around. It would seem the english version is somewhat faithful to the original. Now, I’ve posted this quote, obviously, not as a random question, but because it may relate to the article at hand. b) it is not, as it was only addressed to the Coptic Churches and not the Universal Church. Now, obviously I have no clue which one of this is correct, but I also read that John Paul II confirmed its validity and the one of Boniface VIII’s Unam Sanctam, also on the matter of EENS. 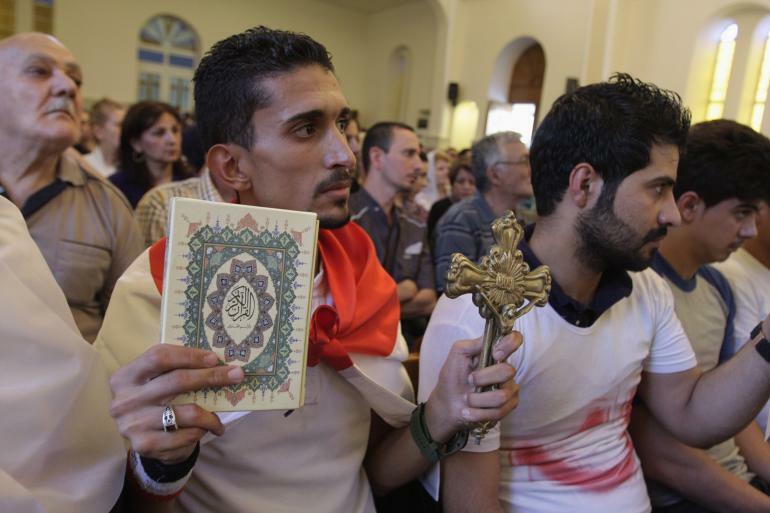 Assuming they are dogmatic, and that the so-called “baptism of blood” is only valid for Catholic catechumens as I have been told, shouldn’t we worry about our christian brethren in Iraq, seeing how not all of them are in communion with Rome? I don’t know the stats, but I guess a significant portion isn’t. So, not only their earthly lives are in peril, but also their eternal ones, as we cannot have certainty that their martyrdom will at least guarantee them salvation. In light of this, shouldn’t we act firmly and decisively to try and stop this barbaric demonic massacre without deluding ourselves that “they at least will be martyrs and have justice in the next life” so-to-speak? It’s a fair point. That is, we can’t presume to know if non-Catholics will be received into heaven as Holy Martyrs for having given up their lives for the faith. Judging by Cantate Domino, we can be certain that even martyrdom does not guarantee a place in heaven to “pagans, Jews, heretics and schismatics.” As Blessed Pius IX explained in Quanto Conficiamur, they can only attain heaven if they are invincibly ignorant of the Catholic faith and entirely free of deliberate sin. However, we can hope that this is the case for some of these poor souls – I’m thinking particularly of the little ones. But, then again, I don’t think Louie was suggesting that we stop providing them with aid and assistance on that account. Matthew, thank you for your response. I have then read Quanto Conficiamur Moerore, but even here I do not find much hope about that. In fact, it would seem the Divine Providence has given us such a document precisely to guide us through cases such as these. I advise everyone to read integrally the letter, it is not very long, just about a page or so. Iterum commemorare et reprehendere oportet gravissimum errorem, in quo nonnulli catholici misere versantur, qui homines in erroribus viventes et a vera fide atque a catholica unitate alienos ad aeternam vitam pervenire posse opinantur . Quod quidem catholicae doctrinae vel maxime adversatur. It would seem that is through virtue of Divine Light and Divine Grace that the invincibly ignorant may be saved, as act of God to the innocent who through no fault of their own, are unaware of the true Gospel. But how does this happen? It would seem through Providence guiding them to the Catholic Church. At least that’s what I took from the text. It would seem this comment section doesn’t like “<" quotations and failed to post all my translations I hade made by hand with considerable effort as to be as close and literal as possible to the original. Here is necessary to remind and correct a very grave error, in which some catholics have miserably fallen, that men living in error and alien to the real fath and catholic unity could achieve eternal life. That is surely extremely against catholic doctrine. It is also known to us and yourself, those invincible who struggle/work in ignorance regarding our most sacred religion, and that are prepared to obey the natural law and its precepts, sculpted by God in all the hearts and to God, lead a honest and rect life, could achieve eternal life per means of acting virtue of the Divine Light and Grace, with (since?) God, who plainly grasps-investigates-knows all minds, souls, thoughts and habit, because of His supreme goodness and forgiveness doesn't allow someone to suffer eternal punishment without the guilt of voluntary transgression. But it is also very notorious the catholic dogma (according to which) nobody can be saved outiside the Catholic Church…. Sorry for the mix-up, pity about the loss, this is just a quick one, due to time constraints. I don’t think anyone here is ‘dwelling in false hope’ that Yazidi or Anglicans or whoever is being killed over there are going to make it to heaven on the basis of their martyrdom. Or did I miss something? I don’t think that’s what Louie is saying in his blog, in any event. I do not trust translations, even with imprimatur, anymore, since I have witnessed serious abuses, whether deliberate or just due to carelessness I cannot say. For instance, Iocunda Semper Expectatione italian and portuguese version never mentioning “co-redemptrix” or “co-redemptress” at all, while in Anglosphere it is often pointed at said encyclical when discussing the concept. Or the mistranlation of the Council of Trent when regarding the matter of baptism of desire in the Vatican II sense. Or again, the only english translation of the Prayer to St.Michael (long version) I could find online, ridden with errors. Now, in the case of Quanto Conficiamur Moerore I have seen (admitting I haven’t bothered to check imprimatur status) some ambiguous translations and rendering floating around forums, used by apologists in various, in my opinion, deceptive ways. My efforts at translating are merely an humble work of inspiration both for those fascinated by Latin, and those looking to compare the different versions of documents. Given the wildly different and incongrous syntax of the english language, it is hard to render them faithfully. Moreover, I was by no means implicating or alluding to Mr. Verrocchio in this case, but to the general attitude of some people, especially Vatican II apologists (“universal salvation” and “absolute tolerance” types) in regards of the extremely grave situation of christian persecution. Both from a theological (?) and practical standpoint. Have to agree with Bert here, about the imprimatur. When we were just out of Catholic school in the 70’s, we came across a paperback for Catholic couples, that had a nihil obstat and an imprimatur. To our amazement it promoted practicing masturbation. As we “thought” that was wrong, but were so confused by the book’s credentials, we called a Catholic parish and talked to a priest about it, and thank God, got the truth from him. You cannot trust the hierarchy today–imprimaturs or not! This is only the beginning my Friends. Today, it is the Christians in Iraq. Tomorrow, it is the few remaining Christians remaining in neo-pagan western countries. Unless you want all the Latin-illiterates to have to suffer with the below google-tranlate’s version of that prayer, maybe you could do the job yourself? “These most crafty enemies have filled and inebriated with gall and bitterness (Lam 3:15) the Church, the spouse of the Immaculate Lamb, and have laid impious hands on all her desiderable possessions . I took the liberty to revise the wiki translation because, even though I’m in no way a scholar, even I could tell the translation was very imprecise. Noteworthy is the “Stories about the origin of the prayer” section. Particularly “according to Leo’s private secretary, Monsignor Rinaldo Angeli, Leo XIII had seen a vision of demonic spirits who were congregating on the Eternal City (Rome); he wrote the St Michael prayer, and often said it, in response”. Also keep in mind the prayer is strictly related to the famous Exorcism written also by Pope Leo XIII, and still used today by many exorcists (including Fr. Amorth) as the most effective one, after the name of Jesus itself. Now, the passage could refer to the Italian conquest of the Papal States 20 years prior and the ongoing abuses toward the Church and her properties. But would really a pious and holy man such as Leo XIII write a prayer to St. Michael himself for such earthtly things? I do not think so. Plus, there’s the exorcism very close connection, which suggest more sinisters recipients. And the fact the prayer was to be recited after every Mass in the following years and I think Leo XIII wanted the practice to remain in perpetuity, possibly because he had felt the upcoming changes and challenges, or because if he really did have a vision, knew he was speaking of things to come.. Thank you much for the prayer, and your tweaking. I also could not activate the “reply” link on the post where the long version of the St. Michael’s Prayer was posted so I have to post at the bottom. I wanted to share a solemn warning that the long version of the Prayer to St. Michael the Archangel should ONLY be prayed by ordained priests!! I had seen mixed thoughts on the guideline, online and then checked with my pastor about the issue. Father reinforced that the long version of the prayer should NOT be read/recited or prayed by laymen. As he said, it is akin to stirring up a spiritual hornet’s nest of demonic spirits and the layity are not sufficiently spiritually protected from these demons. are you sure you are not getting mixed up between the Prayer (long version) and the Exorcism itself (which contains the prayer? Not only that, but I’ve seen videos and testimonials of Exorcists saying laity can, as long as they’re in a state of Grace, even recite the Exorcism as a Deliverance prayer (obviously ONLY if needed and if one feels secure in his faith). There is also the SOLEMN Exorcism, which obviously is forbidden to ANY layman, and only an ordained priest with the express authorization from the Bishop of his Diocese can perform, because it is an AUTHORITATIVE rite. I’ve researched the matter of demonic activity and I’ve never heard an expert or exorcist say a PRAYER can invite demonic activity. Especially since the prayer was designed to ward them off. And remember, demons can’t do anything God doesn’t allow them to. Obviously reciting the Exorcism/Deliverance prayer, especially if one is in a state of mortal sin is a different matter entirely, as that entails ENGAGING the demonic forces and is definitely very dangerous, and should be done only by experts. I’ve never recited the long version myself, because it is not very suited because the complex language and lenght. Thank you for your reply. 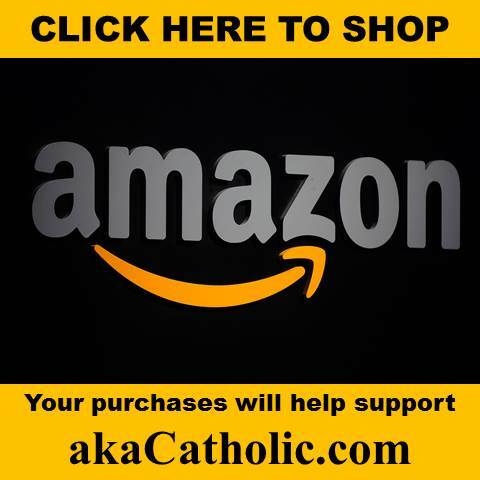 As I first stated, I had been personally concerned about the different information I was reading about the “long-form” of the prayer, composed by Pope Leo XIII and specifically asked my pastor, who is a priest with the FSSP. I appreciate your input but, for my part, will submit to Father’s guidance. We always pray the short form after each low Mass and I try to pray the short form repeatedly, throught each day. Further, I personally pray the daily prayers for laymen of the Auxilium Christianorum (dot org) recommended br Fr. Chad Ripperger, FSSP to engage in Spiritual warfare. It is said both the short and long form of the Prayer to St. Michael might be very beneficial, especially to ward off evil influences against one’s life and family. There is also a non-solemn version of the Exorcism that is basically a Deliverance prayer and can be recited by the laity too. I sometime recite the short prayer (which you can easily find in many places). The long form is very beautiful and evokes powerful emotions. Please note the english version circulating around, pretty much everywhere, still holds true the sense and scope of the prayer, it’s just imprecise at times. The prayer was recited after every Mass up till 1964, when of course Paul VI had to remove it for the Novus Ordo. He also removed the Exorcisms from the new Baptismal Rite. I’m starting to believe the exponential increase in demonic activity in the last few decades (possession/oppression/attacks) is partly due to these changes, in addition to the general and massive falling out from the faith. Already I have mentioned the copious false signs and apparitions common to our day (Medjugorje, Bayside, Amsterdam, etc). And keep in mind many go unreported or underreported. For instance many Protestants claim to be speaking with “Jesus” or the “Holy Spirit” not in a figurative sense. There’s also the obvious presence of malign spirits in the charismatic movement, especially in its more extreme fringes (the ones with people being taken over by “something” forcing them to behave like animals rolling on the ground). Scary stuff. It seems to be getting worse with an accelerating pace. — Tony Palmer was called in by John Paul II to work with the movement in Rome for “unity” between his evangelical friends and the Catholic Pentecostals. Add Garabandal to your list. The seers used to be awakened in the middle of the night and walked backwards through the town in the dark without stumbling, so fast, people couldn’t keep up with them. Joey Lomangino took over as promoter as a young man. He was blinded in an accident, and one of the seers said Our Lady said he would be healed before death. He grew old still gathering believers and doing publications. He just died recently. Still blind. The site now claims they know he can see now, in heaven…arrggg! __ wicki lists it as a place of Roman Catholic pilgrimage, alongside the warning that the Church disapproves. yes of course. The apparition at Garabandal also predicted that only three popes were left before the End of Times, after John XXIII. Obviously this didn’t happen, either, no matter how much you spin facts around. Also curious how these false apparitions seem to UNFORTUNATELY endorse Vatican II changes both in liturgy and doctrine, both directly and implicitly. These demons seem also to like John Paul II alot. About the Charismatic movement, it seems to have a huge following, especially among young people all over the world, and growing. You can find videos on Youtube showing just how insane all this is. And Francis seem to view favourably this ordeal. Ps- have you read my message on the other page (Tony Palmer) about talking on G+? I really don’t feel comfortable about polluting the comment section of this nice site with unrelated topics or personal discussion. Especially since I noticed the page gets slower and slower with each posted comment. Sorry the G+ is a no-go for us. If you do change your mind about doing a Forum, they’re very easy to set up, and not at all a waste of Louie’s blog, as all these topics relate to the world we’re living in. He’s got a general topic that can be used for anything. And it’s nice to leave it open to all. 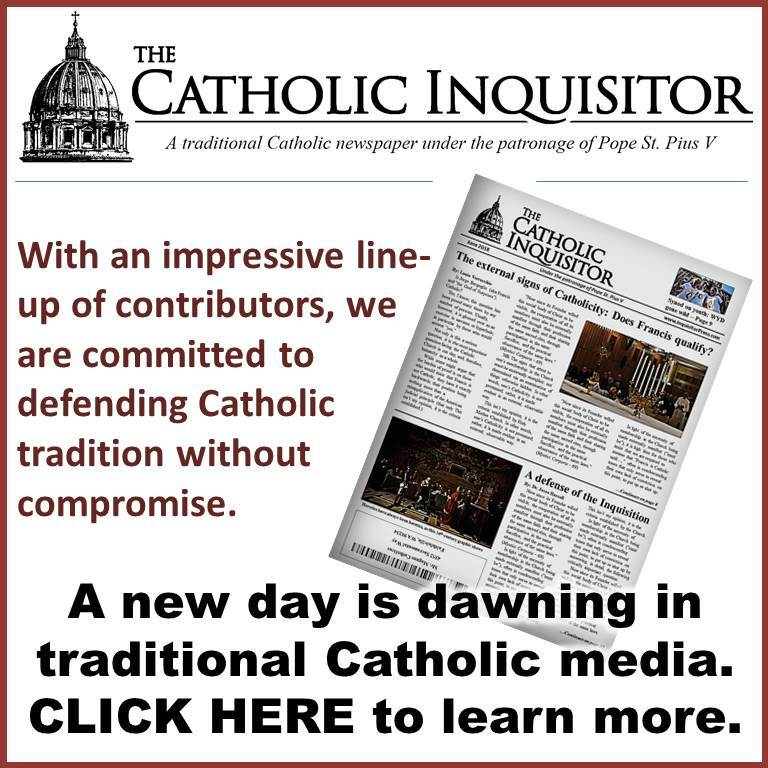 We have nothing that needs to be done in private, and that helps keep it very Catholic. that is a shame. I don’t know how to start a forum (? ), if you do could you please point me in the right direction? Thank you. By believing or not worrying about the matter, you lull yourself in a false sense of security but in my view it is a pretty big gamble to take. Risking of being in a state of Mortal Sin in the event the Lord would choose to call us to Him today or tomorrow. Dear Bert, Sorry this is so late, just saw your post. Starting a Forum is super-easy. Just click on Forum at the top of this page. Once in there, go to the bottom of the page and put in your initial comments in the largest (central one)of the three spaces. Above that larger space where you put the comment, is a small space for the Title you wish to give it. Below the Comment space, is another small space where you can add a subtitle or related ideas you wish to tag on to the sub. When done just submit it, and it’s ready for others to add their comments. This has been really heartbreaking. We appreciate the great value of martyrdom; but the Pope- most known for his concern for bodily needs-seems to exhibit a defeatist attitude towards the slaughter of this flock he guards. While it is unjustly physcially attacked by ISIS and others around the globe, he calls on the body proven most ineffectual for defense of Christian life everywhere- the UN armed forces, to defend them. Were the Crusades intrinsically immoral? Or did the immoral atrocities coinciding with them, leave us so profoundly apologetic that we mistakenly think God wishes Christendom to sit back and watch, as global Jihadists slaughter outnumbered, out-weaponed Christian women, young children and babies, precisely because they are what we also wish to be called? Doesn’t the Church teach a responsibility to defend innocent life from conception to natural death, as well as the obligation of governing bodies to protect their innocent citizens from unjust agression, using deadly force as necessary when all other means have been exhausted; and to deputize larger numbers of citizens to join in that defense as needed? Is not the Vatican a state, and are not all the Baptized it’s citizens? while their leader was too weak to fight. We not the Moslem attackers of the past driven back only by Papal crusades? Yes, we should urge all to valliant martyrdom when it comes suddenly without recourse, or even to individually seek it if desired to save their souls or others, but is there not also an obligation to defend against that being the fate of all Christians on this eart right now , while some still have the means to prevent that? And since the states are right now failing around the globe to protect Christians,should the Pope not call for a new kind of Catholic crusade, avoiding the abuses of the past, but going after these enemies of God’s people? Is rejection of that idea based on a choice to select one part of what Jesus said, and misapply it, as the modernists have done for 50 years praising His love as shown by Mercy, while never mentioning His love as shown by Justice? God gave his son up to human slaughter to save our souls. Are we now to say that ONLY the soul matters, and not the protection of anyone’s body? **Please NOTE we’re not at all assuming (Louie) is implied by or included in that group, this is not a rebuttal of his points, but a question of why there is a need for them. Yes, Indignus Famulus, Just as a father has the duty to protect his wife and children, so too is there a duty on the Catholic Church to defend its members, and other threatened innocents, by physical force as necessary. This means people being trained for same, some to a lesser extent, some to a greater professional extent. A martyr is a person who willingly suffers death, rather than renounce his or her religion. Is it a requirement to do such without resistance? Could not a martyr be one who sacrifices their life to protect the faithful innocent from the evil onslaught of those wishing to destroy any person desiring to give honor and glory to God the Father, Son and Holy Ghost, and venerate those of the Church Triumphant, and to stop the destruction of places we gather to worship? Surely the Holy Knights of the Crusades, be it Knights Hospitalier, Knights of Calatrava, Knights of the Teutonic Order, Knights of Santiago, Knights Templar, when losing their life in the line of battle were having a Martyr’s Death? If the histories are true, before the first Crusade, Pope Urban II, delivered a speech at the Council of Clermont, in France, at which several hundred clerics and noblemen gathered, calling rich and poor alike to embark on a righteous war to help their fellow Christians in the East and take back Jerusalem, promising absolution and remission of sins for all who died in the service of Christ, even if it happened on the journey or voyage there, or in battle. –Though many of those you mentioned served honorably in a variety of crusades , the results were a mixture of valor and tragedy, apparently depending on the virtue or vices of the participants and leaders. Over time a lot of corruption seems to have crept in, because of the magnitude of the undertakings, lack of oversight, sometimes Papal corruption-the Church grew in temporal power and wealth, etc. leading to many failures. But they did manage to take back Jerusalem for a while, drive the threat from Europe and protect the rest of the continent. One inspiring story relates that when they conquered Jerusalem they decided not to make anyone King at the time, because it wouldn’t have been right to have someone wearing a crown of gold, where Our Lord once wore a crown of thorns. Sometimes, it is right to wage war in the Name of God. Sometimes, it is a moral duty. Of course, at all times, we have a duty to wage spiritual war against evil. A Catholic martyr must forgive his murderers before his death to earn the title. I would hope to forgive my murderers, but I hope to be able to prevent them from doing it again. OUCH! Ouch, because it’s accurate. It’s a darn-near perfect analogy. Our SSPX priest this past Sunday led the congregation in a decade of the Rosary for the suffering souls in Iraq. Truly, satan’s bloody fangs are revealed there now in this “religion of peace” that Pope Francis fawns over as clearly as they ever have been. Incidentally, our priest also praised the bishop in Oklahoma for “acting like a bishop” in requesting his flock to fast in reparation for the abomination about to take place in his diocese. Ordinations in St. Louis Missouri at the Institute of Christ the King. Check out the Cappa Magna. Fitting for a true Renaissance Prince. What are the odds of Lumen Gentium getting a serious re-write? Bergoglio said, ‘Hatred is not to be carried in the name of God’. Bergoglio constantly preaches hate in the name of God, against God’s own. Whereas idiot demonworshippers are not killing in the name of God, they are killing in the name of a demon called al-frikin-lah bergoglio! WAKE UP. So long as blancmange-so-called-bishops like Bergoglio support al-frikin-lah they have blood on their ungloved mitts – yep bergoglio who thumbs his wretched modernist thumb in Christ’s face at the Vatican just a hop skip n jump in time ago – ladies and gentlemen – Bergoglio – antichrist-antipope. Wake up would-be apologists who have not yet been made part of satan’s harem. p.s. notice i called bergoglio antichrist with a little ‘a’ – he’s not nearly influential enough to deserve the big ‘A’. 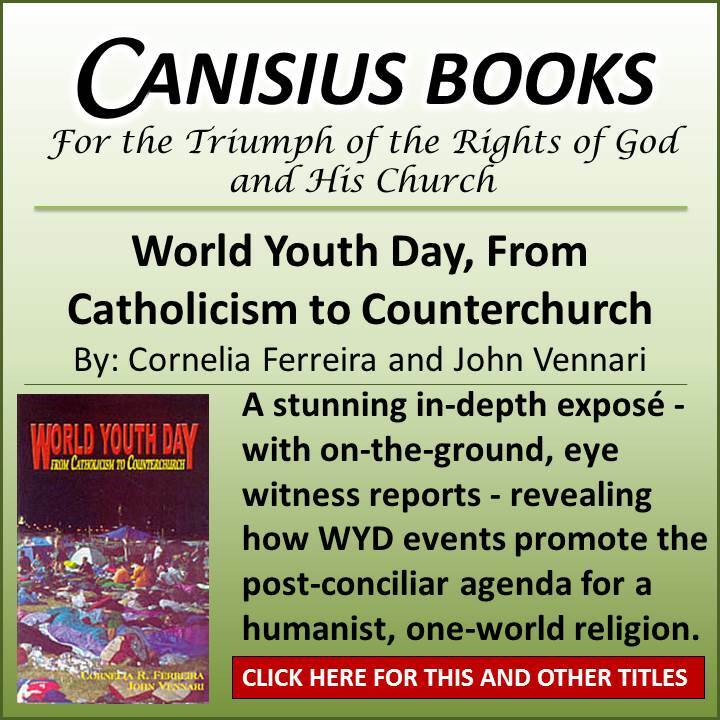 Unfortunately our grandchildren might be left to see such a one, and with no sacraments, pope or smidgen of the what the Truth is, left – except in a true ‘remnant’ for which we are responsible.